Here are Easy Massage Chair’s Top 5 massage chairs for Winter 2019. On all of these models we guarantee you the best deal. This is a really well known chair so you probably already heard of it. It’s the only massage chair that is good enough to earn the title of “Medical Massage Chair” from both the FDA and from UL which shows just how good the quality of the massage is. This is one of the only chairs made in the USA. 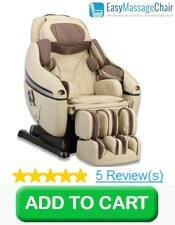 It’s highly adjustable so everyone can find a setting that is comfortable for them. And now with the improved Plus model, it’s even more adjustable. The benefits of the Plus model are that you can now customize the intensity level of each part of your body independently, and you can adjust the speed of the massage motions as well. All in all, the quality of the components, the quality of the manufacturing, and of course what matters most is the quality of the actual massage, is really second to none. There really isn’t a better chair than this. It’s really easy to use. The remote control is probably the very easiest to use out of any massage chair. It is designed and fashioned to look like your smart phone so it’s a touch screen. You can basically just point to the part your body that you wanted to massage. You can easily pick it up and you’ll know how to use it with just one or two tries. The Luraco i7 Plus is known for having one of the best stretch massages out of any massage chair ever. This chair has loads of other benefits including three different heat therapy zones, it’s got great foot massage and just in general this is one of the most popular and one of the most highly rated massage chair so that’s why the Luraco i7 Plus has earned the number 1 spot on our list. 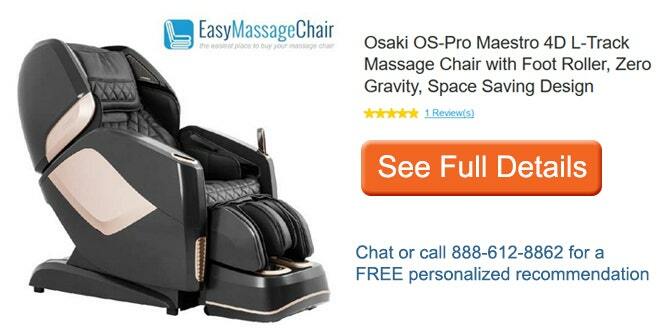 Next up on our list is the well known Osaki OS-Pro Maestro and as with all chairs we guarantee you the best deal. You may already know but in case you don’t 4D is 3D but plus a bonus. So a 3D massage means the rollers go up and down. They also move side to side and then they will also push deeper into your back or they can retract to be more gentle depending on what you like. The 4th dimension or basically the improvement that 4D offers over 3D, is that the speed of the rollers will also adjust so that the massage can focus more time on the muscles that are most tense, that need the most attention. So that’s the new advanced benefit of 4D. And then L track massage means that the rollers will go from your neck and shoulders down your back and all the way to under your glutes so it’s gonna massage your glutes muscles as well. So in short the 4D Maestro massage chair has been really really popular ever since it debuted just a few months ago in the summer and it’s been one of the best reviewed and best selling chairs. In addition to excellent full body massage, it also offers heat therapy, zero gravity, bluetooth and all of the premium features that you would expect from a top of the line chair. It offers calf kneading massage so this is a kneading motion to emulate a masseuse’s hands for your calves’ massage. 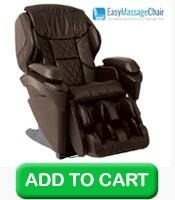 And so for the premium massage chair market, the Maestro is one of the best in values that you’ll find. We have sold a lot of them already and customers are really loving it. Next up we have the Panasonic MAJ7 and for the holidays we’re offering free indoor set-up service and the free extended warranty as a holiday upgrade. Simply put, the J7 is the most premium massage chair on the market. And it also comes from the world’s best known Japanese massage chair company, Panasonic. The J7 is the most rejuvenating, therapeutic massage chair available and the quality of the craftsmanship and the components is really unrivaled. This chair is very new, it's only been out a few months so as you can expect that it packs the most advanced benefits and features for you. Who is this chair good for? 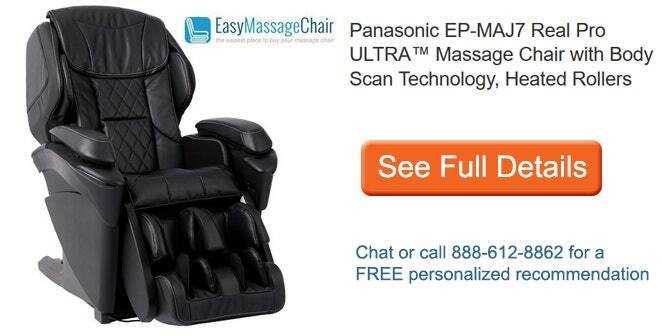 This chair is great for you if you enjoy a very intense massage. The 3D roller system offers what Panasonic calls “luxurious pain” so if you’re someone that likes a deep tissue massage you would definitely want to consider this chair. This massage chair is also for people that really just want the best of the best for their health and well-being and do not want to compromise on it. The J7 is excellent for massaging your neck and shoulders and the top of your trapezius muscles. 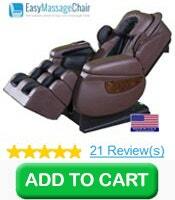 It also is great for the lower back and foot massage as well. And even for the glutes massage it uses an advanced combination of rollers and airbags. The J7 is perhaps the chair that most closely resembles a massage from an expert human masseuse. How does it do that? First it uses a very precise body scan that literally measures hundreds of different points in your body so that it can deliver a very precise and customized massage that’s perfectly fit for your body size and body type. It also detects the tension in your muscles and carefully adjusts the massage pressure accordingly. The MAJ7 massage chair is going to be measuring the tension in your muscles about one hundred times per second and the reason it does that is it’s going to know which muscles are tight, which muscles are relaxed and then it can target the massage for the areas in your body that really need it the most. That is something that really no other chair on the market can say they do as well as the J7. So that it can provide the right amount of pressure it also uses a unique pressure sensor gauge so that it can pull back or press harder based on your preferences. The J7 allows you to control the intensity of each body part independently so that every part of your body is getting the right amount of pressure that feels good for you. It also offers premium features and benefits like heated rollers, shiatsu massage mode, of course there’s 3D massage and a really great stretch massage mode which is better than L track massage chairs can provide. So the J7 is really the best of the best in terms of quality and a very precise and customized massage. Next we have the Inada Dreamwave. This is perhaps the most famous chair in the industry and we’re proud to be one of the leading distributors of the Inada Dreamwave. It is being offered by us for a limited time with free indoor setup and assembly service and also the free extended warranty. 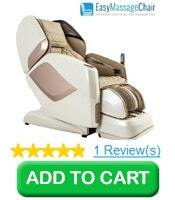 The Inada Dreamwave is famous for being known as the world’s best massage chair. It’s really excellent for you if you prefer a gentle, soothing, dreamlike massage experience. 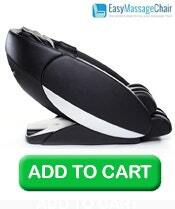 It’s really great for the upper shoulder, neck and trapezius muscle and one of the reasons why is it has a unique head rest that also includes its own massage mechanism within the head rest itself. That’s something that really no other chair does in quite the same way as the Inada Dreamwave. And in our experience in using the Dreamwave and hearing from our customers that have purchased and love it, probably the best and most liked feature of the Dreamwave is the really refined choreography. By choreography what we mean is the timing of the movements. For example it will massage your left shoulder just the right amount of time before it moves over to the other side of your body and it really just takes you on sort of a massage journey, taking your body and your muscles through just the right time of massage for each body part. 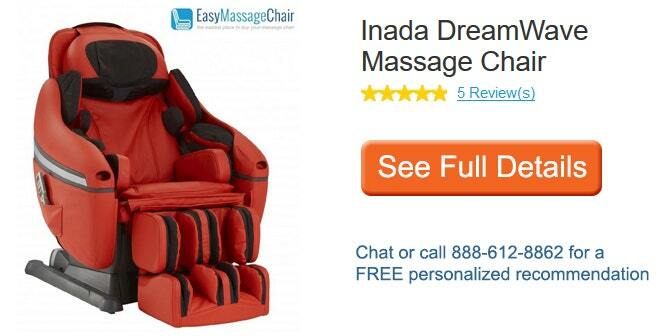 You can really be put into a dreamlike, really relaxing experience with the Inada Dreamwave. So you probably already heard enough of the Dreamwave because it is really famous for delivering super high quality massage. If you have any other questions on it you can always contact us. And that brings us to the Human Touch Novo XT2. As always, we guarantee you the best deal on this model and very other model we carry. For a limited time for the holidays, we’re including free indoor set up and assembly service which is also known as White Glove service and we’re also including the free 5 year warranty. The Novo XT2 is well known for delivering a 3D massage roller system as well as L track roller system. So a 3D massage is able to deliver a very very intense massage or it can be dialed back to deliver a gentle or very gentle massage mode. In short, it can provide the intensity setting that’s most comfortable for you. This is a really popular benefit in households with more than one user because everybody will find a setting that’s right for them. And then of course the L-track roller system means that the rollers will provide high performance coverage from your neck and shoulders all the way down your back, your lower back and even continue further to massage your glutes muscles and under your hamstring muscles as well. That’s the beauty of L track massage. The XT2 also offers one of the highest number of massage programs so you’ll be getting 35 auto wellness programs. These are preset programs that, with a push of a button, will take you through a very carefully programmed and choreographed massage program that covers from your neck all the way down to your feet. Each program is a little bit different so it’s tailored to offer you the best, based on what your body needs at the moment. Whether it is just waking up and wanting to refresh yourself, improve your circulation or at the end of a long day to help rejuvenate and relieve any sore muscles. So of the 35 wellness programs, you can easily find a few that are your favorites. There is a full body stretch on the XT2 which provides unprecedented leg and spine relief. 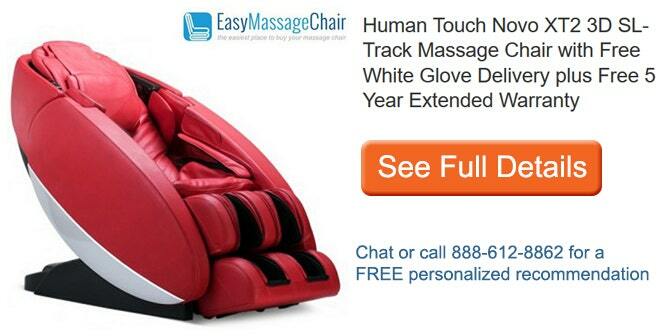 This is one of the best stretch massages of any L track massage chair. The Novo XT2 being a premium massage chair, it’s going to provide you with a number of premium benefits such as a bluetooth app functionality so that you can control the chair right from your phone, premium speakers so that you can play whatever music you like -- relaxing music or if you want to listen to an audiobook. It includes premium speakers built right into the chair. And it offers you space saving, which means that it only needs about two inches of space between the chair and the wall. When you turn the chair on it’s going to gently slide you forward away from the wall and then it reclines back. So this saves a significant amount of room instead of having to keep the chair about 24 inches away from the wall which some of the older chairs that don’t have space saving would require. If you have any questions on any of these chairs, please contact us. Easy Massage Chair is proud to be an A+ BBB business since 2005 so we’re accredited with the Better Business Bureau. We guarantee you the best deal on any chair. We offer you 60 day easy returns. If you don’t absolutely love it, just give us a call we send a truck to pick it up from you. There’s no sales tax due outside of New Jersey, and for our New Jersey customers we even cover the sales tax for you. There are no additional taxes or fees on top of the prices you see. We care about easing your pain and promoting your health and well being. That’s why we are in this business. So if there’s anything we can do for you, anyway that we can be of service, please give us a call. We hope to earn your business this year and if not, we still wish the best for you and your loved ones. Thank you so much.